Mr.Satish Assistant commercial Manager who was here on a brief visit made it clear that due to the doubling of the line more space will be required at Belagavi station and hence it would be apt to shift the said Goods Shed to Sambra. Earlier also such plans were discussed but on paper only. Once the Goods Shed is moved from here in about 9 months there would another Entrance made from other side the Current Goods shed side. This also has been a long pending demand of the citizens for another entrance with proper platform from the Good Shed side. 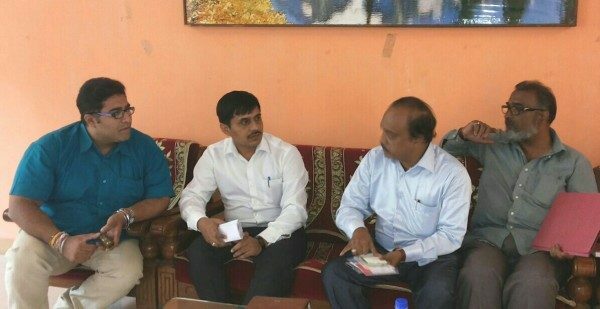 More points relating to the Belagavi station were discussed in the presence of Satish Tendolkar member DRUCC, Mr.Gupta Commercial manager and others. Truly a realistic plan. It will benefit both the passenger & goods sections of the railway station. Also the existing railway building to be upgraded as per the plan. Hope the authorities (mainly from Hubli division and our Hon. MP) will respond and act proactively.